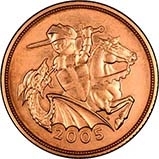 The 2005 sovereigns feature a re-worked and stylised version of the traditional St George & the Dragon design. 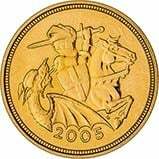 For more information see our 2005 Gold Sovereigns blog. If you're looking to buy bullion, we have a dedicated page for bullion gold sovereigns. The 2005 sovereigns are not alone in featuring a one-off design; other one-off designs include the 1989 500th Anniversary Sovereign, the 2002 Shield Reverse Sovereign issued to celebrate the Queens Golden Jubilee and the 2012 sovereigns commemorating the Queen's Diamond Jubile.